I suppose it is fair to say I’m sort of a maverick when it comes to my gear choices. I do not feel much compulsion to follow the herd. I have a couple of personal mottos of sorts that are relevant here. One is “respect authority, but always question it”. The second is “conventional wisdom is only conventional”. I freely admit to always being on the lookout for something that is a cut above what is expected. For the occasional diamond in the rough. With our current range of optics, the choices for modern binocular selection have never been better. They have also never been more confusing. Hardly a bad choice today from say $300-500. There are also a lot of choices there too. I recently came across a pretty new company operating out of Lander, Wyoming called Maven Outdoor Gear. They are currently offering three different binocular models. The B1 is a traditional Schmidt-Pechan 42 mm size in 8 and 10x. The B3 is a compact Schmidt-Pechan 30 mm and offered in 8 and 10x. The B2 is a different sort. It is an Abbe-Koenig design and comes with 45 mm objectives in 9 and 11x. This is the one that immediately drew my attention. I did some research and had a couple of conversations each with two of the owners of Maven. 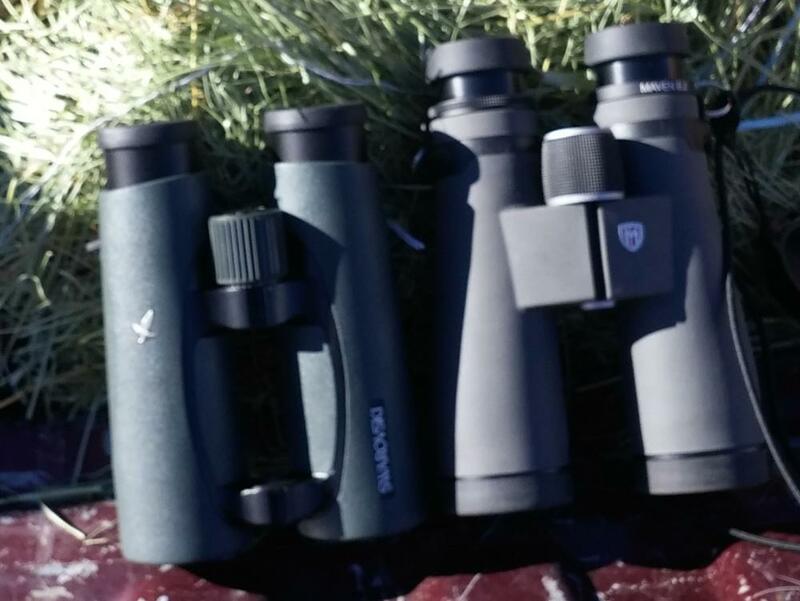 I liked what I heard, so I now have the 9x45 binocular that is the subject of this review. Maven is taking a unique approach to binocular sales. They have no wish to support the traditional multi-layer distribution system that goes through ever higher price steps as it makes its way to the consumer who opens the box. They have decided to sell directly from their site to the customer. They have entered into a partnership with the premier Japanese optical firm of Kamakura who is widely known for its abilities, and can build any level of optics required. They have made their history as a manufacturer of OEM products for other companies. We don’t see Kamakura binoculars as their own brand, we see them in binoculars like these from Maven. With their direct to consumer sales approach, the consumer can see dramatic cost savings. Maven is also unique in offering the customer the option to choose from a wide selection of different exterior modifications allowing for the chance for a truly unique binocular. I’m not crossing forum rules and posting links (I asked moderator advice here) but Google is your friend. I’m not sure SWFA would class them as a competitor as they may view Maven more of an optics company rather than a dealer who also sells what SWFA does. But at any rate gents find it yourself . There are three different stock options with black or gray armor. In addition you can choose from five different camo finishes for the rubber armor, you can choose the color of the strap attachment rings, the ocular rings, the focus wheel, the tripod adapter cover, and the objective rings. You can stay conservative with stock black or gray, personalize your own stealthy camo, or be brave and go for the gusto with various combinations of orange, pink, green, blue, red, green, silver, or white. It’ll be a Maven inside, but yours on the outside. I confess to ordering the stock gray. Using the customization option will add a week or two to the order, as that is done at Kamakura USA in San Diego. The camo finishes are applied to the armor in a hydro dip process and will smooth the surface of the binocular slightly. There is also an option for engraving. Full advantage of options can add over $200 to the $1,000 base B2 price. Another unique, and as far as I’m concerned totally welcome, approach Maven is taking is inspection of every unit before it is shipped to the buyer. Every binocular goes on the collimation table in the Maven lab. Every binocular gets an inspection for performance match between each barrel, and to be sure everything functions as it should. With no dealer network it is hard to try before you buy, but they offer a two week return policy. You order with the demo function on the website, your card is charged, and refunded upon receipt of the undamaged return binocular. They have an uphill road being new. But they are standing behind the product with a lifetime fully unconditional no fault warranty. Actually, the maverick in me likes to go with the new guy who dares enter a crowded field with a unique approach, coupled with an outstanding binocular. I chose to support them both by the review route and in buying the binocular. This really is a binocular I want for myself and have no hesitation in recommending it. This is a big, stout binocular. It comes out of the box looking like it means business. Look through it and you see for yourself it does indeed mean business. It is 7.5” long with eye cups extended and ocular and objective covers in place. 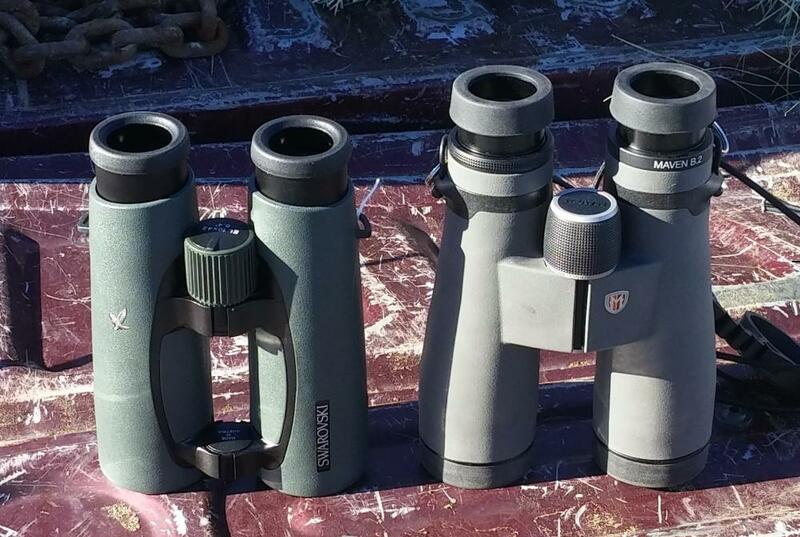 The bare binocular is 33 oz., 34 with the covers, and 35.5 oz. with a Rick Young Harness. A first I figured it might ultimately prove too big, but that idea perished pretty quickly. This is the best balanced, easiest handling, best feeling in the hand binocular I have ever tried. Not everyone will agree with that. I have relatively large hands and for me it is an advantage. Smaller hands may feel differently. This has the nicest, grippiest (is that a word?) armor on anything. You will grip sufficiently, wet or dry, wherever you grab the binocular. It has world class specifications. The light transmission is listed as peak performance of 93.7%. That figure can be looked at with varying degrees of acceptance, but I find no reason to doubt the claim. It is every single bit as bright as the 10x42 EL Swarovision I was able to use to compare it to. It defines the same fine lines on any resolution chart with the same degree of sharpness as the EL SV (using a 9x vs 10x distance correction). The color balance is absolutely neutral, in fact the image characteristics of the Maven and the Swarovski are very similar. While I don’t want to get into an out and out contest with Swarovski, the comparison is unavoidable (or with any other top brand). I must admit, this big B2 caught me by surprise. After my conversations with Maven I should have been better prepared for what I saw. I had it in my head that I was going to be looking at another of the recent crop of very good $1,000+ binoculars now available. After a while it began to dawn on me that there really is a cost to quality improvement being offered here. Maven is getting a Kamakura glass based on Japanese labor and materials which, while those are higher in Japan than they were, are still considerably less than Germany and Austria. 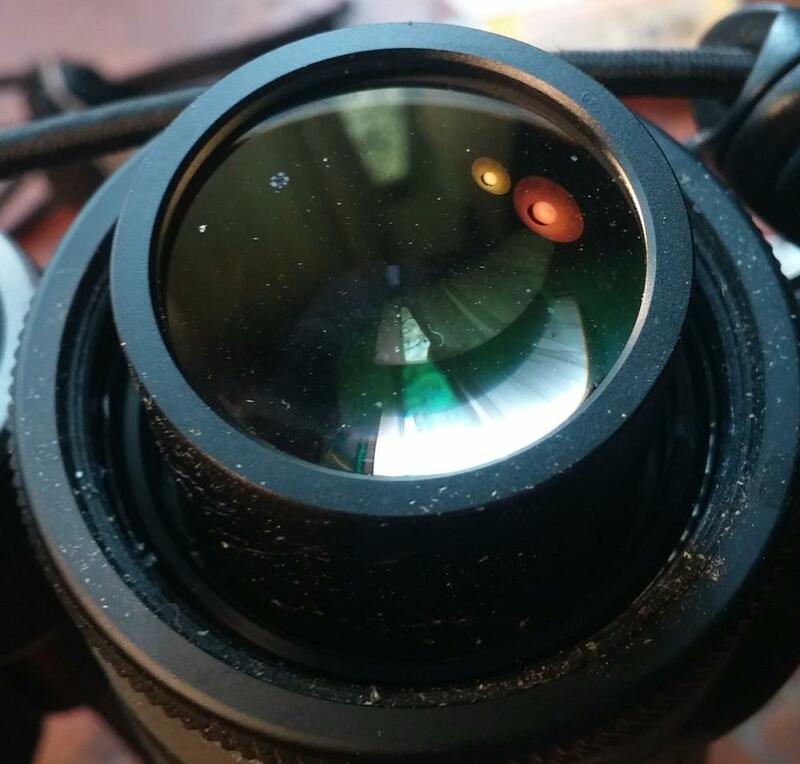 Instead of a more complicated and more expensive center diopter, it has the right ocular ring. Instead of jumping into the flat field technology business, Kamakura settled on a very well done classical edge, avoiding several hundred dollars of expense. They also chose not to use fluorite glass, instead using more conventional high grade ED glass for CA suppression. Some may nay say about these decisions, but had Kamakura and Maven gone another route, we would have had a more expensive, and not necessarily better binocular. The image is a wide field one with a very wide sweet spot. The fov is 377’ or 7.2* with an afov of almost 65* (59* for those who are inclined toward the arc tangent method). I’d estimate the sweet spot to be very close to 6.5*. There is a slight curvature, and a small ring of pincushion. Unless you are edge obsessive, it is about perfect. Not as sharp at the edge as the SV, but more like the SLC-HD. The AK system gives this binocular a 20 mm offset between the ocular and objective, obviously the objective setting wider than the oculars. This does give a noticeable bump to the 3-D presentation to the Maven image. The color balance is absolutely neutral. The color representation and saturation are bright and natural. The contrast is high, image details being popped out in both edge definition and in surface textures. This binocular excels in image detail at distance in twilight and crepuscular times, and in gloomy, gray stormy days. I find CA to be pretty well controlled, but I’m CA insensitive. This is impervious to glare, it will cut through extremely bright situations that will destroy images of many binoculars. 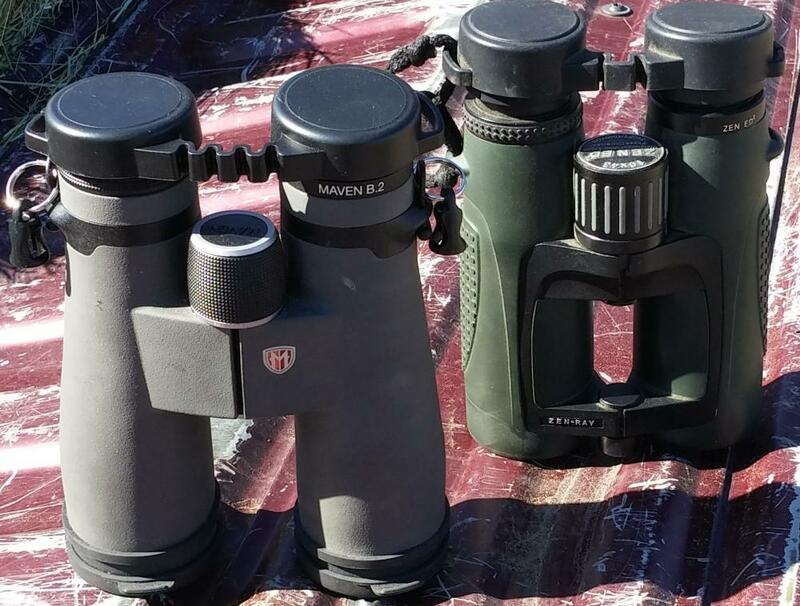 It is pretty customary in reviews of binoculars like the Maven B2, to offer the qualifier…”well it is a good glass, but not big 3”. Not so here. This glass will stand without embarrassment in comparison to anything. I’m not deferring to the altar of the alpha here, but be sure I’m not claiming either equality or victory either. This is not necessarily an alpha killer, but an exceptional binocular that will speak well for itself regardless of the competitor. If this came from Germany and had a $2,000 price tag, not an eye would blink. If you are interested in optics, this seems to me to have changed the $1,000 binocular game. It is well worth a look. Thank you for another excellent binoculars review. Do you have any intentions of reviewing the AK 11x45 model? Not yet, but I might. That is a project or two down the road. Very good review of a very compelling binocular, Steve! Thank you for posting it! Steve, once again, a great review. I have found your perspective to always be fair and accurate and have great respect for what you have to say in your reviews and comments. I will certainly keep this binocular in mind. I always glad to see people enjoy the reviews . Here is another try at a better picture. FYI, I also moved a copy of this thread over to the "Members Tests & Reviews" subforum. Another picture. For whatever this picture would not show up in the review picture, but it did here. I like the refinements to this review. Well done. 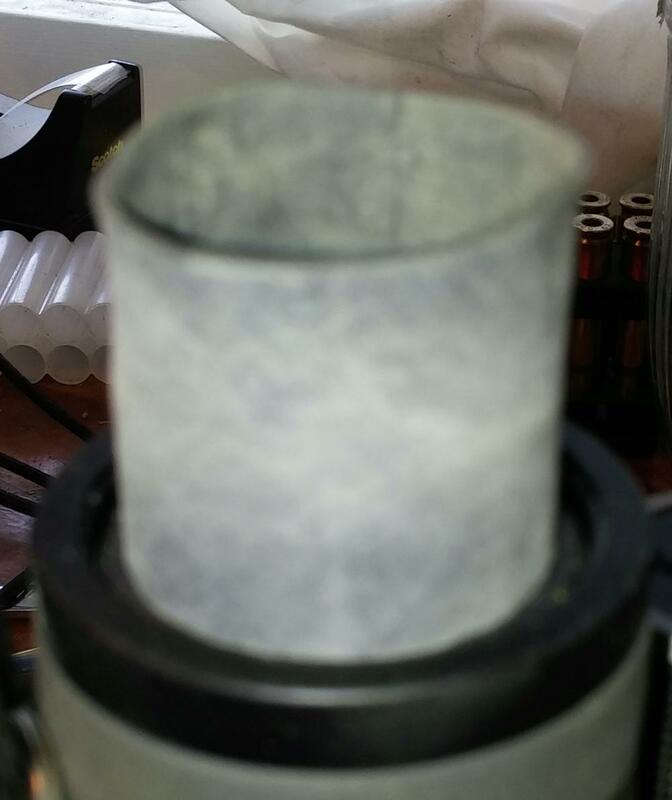 Would you please post a couple of close-up photos of the objective & eyepiece lenses. I'd like to have a look at the color of the optical coatings. There are so many obsessive types at BF that it is hard to anticipate the questions. There are lots of points that need to addressed there. I admit that one got long winded. Glad you liked this one. Thanks. Sure Stan. Don't have any taken but I will do that tonight. A couple of notes. You can see I used the Maven included Op Tech adapt-its in the strap attachment. I don't care who makes the binocular or what it costs, a user is making a mistake in not using something like this. While the Maven strap lug ring is removable and thus replaceable, remember that many binoculars have the strap lug molded integrally with the frame. Bust the lug and you have a busted frame. The metal split rings you see in the photos are for the Rick Young harness. I would not be caught dead attaching a metal split ring to a binocular frame strap lug. For those of us who are unfamiliar with the 'dangers' of the metal split ring please explain further. The dangers vary widely, but even Swarovski advises against this. Depending largely on the binocular the design of the strap lug is likely the weak link in the frame construction. The strap lug is typically cast integrally with the frame. Less of a problem with better Mg alloys and casting procedures in more expensive stuff, what we have is a small rectangular tab protruding from the frame, since it is hollow in the center to allow strap access, the lug is attached to the frame at just two points. When we put on a split ring that ring slides back and forth and usually spends its time wearing against one of the two contact points with the frame. This causes friction wear and shock stress from numerous slight jarring from walking around with the binocular around our neck. The ring slides back and forth as the binocular is picked up and set down around our neck on the strap. All this simply places extra stress and wear on the weak points of the frame. Bust the lug and you have a busted frame. Use an adapt-it or similar and the stresses of normal use are distributed evenly around the perimeter of the lug. Obviously some lugs are less prone to this than others. 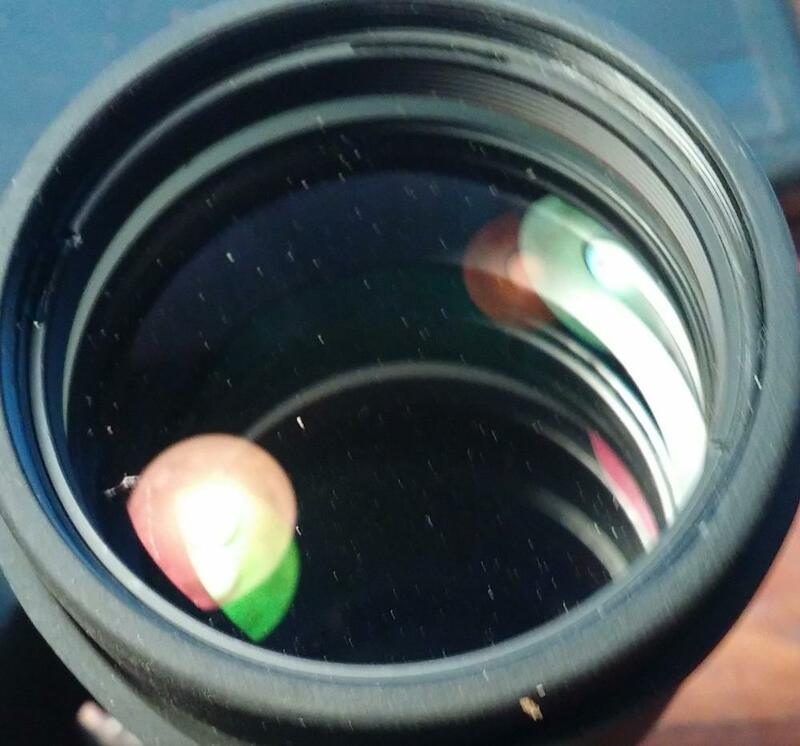 Here are the lens pictures. The duff on the objectives is from me using a dremel tool to engrave numbers in a plastic livestock ear tag. I did not notice it until I was sizing the photo. Thanks for the explanation as well as the photos of the optical coatings. OK, so I just gave myself the observant reviewer award! 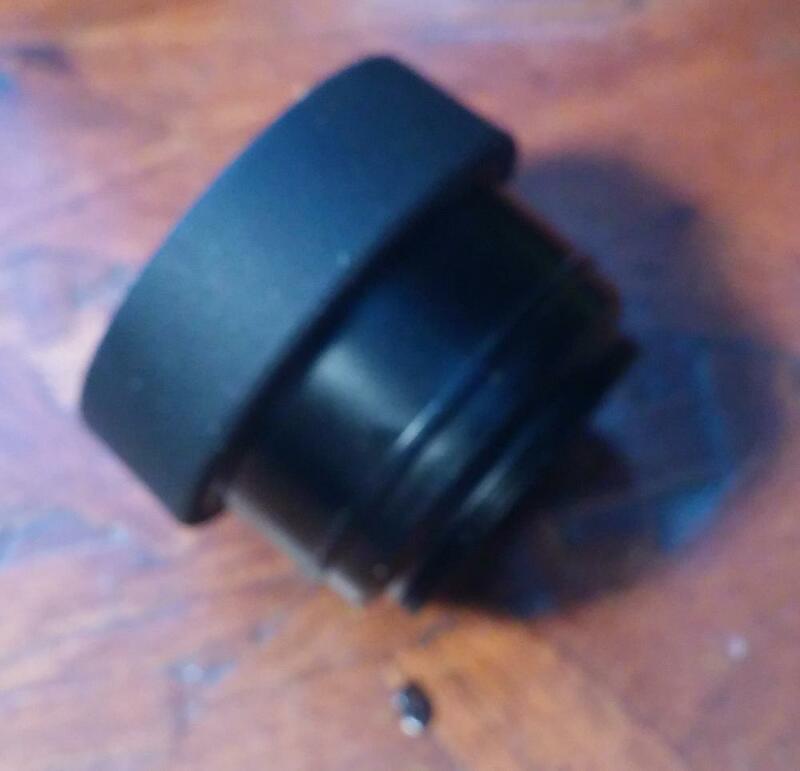 I have had this binocular for a month and it just now dawned on me the eye cup assemblies unscrew from the binocular. Great if you need to add an 0-ring for a little extension of the eye cup. It should be possible to attach a rubber O-ring to the top of the eyepiece housings, once the eyecup assemblies are removed. This would allow those who wear eyeglasses to move in closer to the eyepiece lenses, for a W I D E R FOV, without scratching the eyeglass lenses against the eyepiece housings. I have made such modifications to some of the eyepiece housings, of my vintage Porro prism binoculars, after I have unscrewed the metal or plastic eyecups, etc. The O-rings allowed me to move in closer, when wearing my eyeglasses, & this modification gave me a W I D E R FOV overall. Removeable eyecups are a great feature that every binocular should have. The Maven B1 also has removeable eyecups. 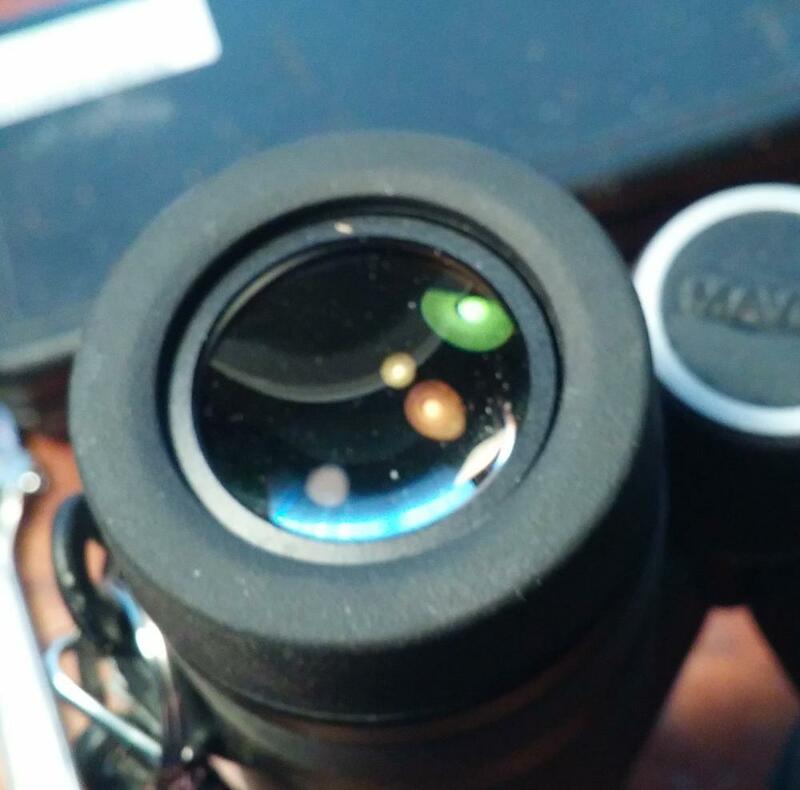 I had the same thought you did, so here are a couple of pictures implementing your suggestion, which works great to get full fov wit eye glass wearers who don't have enough with the stock eye cups. Remove the eye cup assembly use a 1 1/8" faucet washer to fill the bottom of the space used by the eye cup assembly. Cut a couple strips of bicycle inner tubes about 1 1/8" long. Turn the strips inside out. Place the strip over the ocular tube. Fold the strip downwards over itself and you can work the strip down to the point where tou have a new eye cup with just the right extension for your eyes.